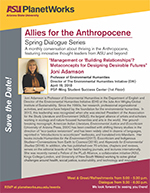 Joni Adamson is Professor of Environmental Humanities in the Department of English and Director of the Environmental Humanities Initiative (EHI) at the Julie Ann Wrigley Global Institute of Sustainability. Since the 1990s, her research, professional organizational activities, and service have helped lay the foundation for the environmental humanities. In 2012, this leadership was recognized when she was elected President of the Association for the Study Literature and Environment (ASLE), the largest alliance of artists and scholars working in ecology and nature-focused humanities and arts in the world. Her groundbreaking monograph, American Indian Literature, Environmental Justice and Ecocriticism (University of Arizona Press, 2001) has been credited with shifting literary studies in the direction of "eco-justice revisionism" and has been widely cited in dozens of languages, reprinted in "introductions to ecocriticism" textbooks, and translated into Mandarin. Her books include Humanities for the Environment (2017); Ecocriticism and Indigenous Studies-Conversations from Earth to Cosmos (2016); and Keywords for Environmental Studies (2016). In addition, she has published over 70 articles, chapters and reviews, serves on the editorial boards of her field's leading journals, and lectures internationally. 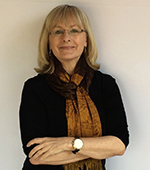 She was recently named a Fellow of the PLuS Alliance, a collaborative initiative (ASU, Kings College London, and University of New South Wales) working to solve global challenges around health, social justice, sustainability, and technology and innovation.